Bagan is a destination you need to see to believe. Pictures don’t do it justice. Words don’t do it justice. It is awesome. Before we arrived, we kept hearing good things about Bagan. We saw all the pictures, but they didn’t prepare me for the multitude of temples everywhere. This is just a standard view in Bagan.. nothing special. Bagan was definitely the highlight of our stay in Myanmar. If you are worried about being ‘templed-out’ by the time you get to Bagan, don’t be. Just go. What’s a temple without several tourist stands? You’re getting the hang of this, Myanmar. High level. Minisbus from Mandalay to Bagan. Detailed. Just your run of the mill awful minibus experience. We were stuck in the back seat sitting four across. Hot, bumpy, and miserable with a driver who loved to surge on and off the gas pedal repeatedly. And when I say repeatedly I mean it. It got so bad Sam started counting the number of times the driver would press on the gas pedal per minute (methodology: one push starts when you feel backward momentum due to acceleration and ends when you experience the forward momentum associated with the driver releasing the gas pedal). The distribution? Anywhere from 7 to 15 distinct pedal pushes per minute. Next time you are driving, I challenge you to duplicate this frequency and let me know how your passengers like it. I’ll let you in on a little secret – they will probably try to punch you. The main thought in my head at this point: I HATE MINIBUSES. We stayed in New Bagan. Mostly because it was cheaper. It’s a little bit further away from the “coolest” temples, but still close enough that we could eBike. Basically, if you’re on a budget, stay in New Bagan. If you can afford it, stay in Old Bagan. Our hotel was called Bagan Nova. The good – clean, good breakfast, nice staff. The bad – this only applies if you are sick (like Sam was) but there are only three television channels: German, French, Chinese (with a few English movies). Not ideal for spending hours in bed sick. Unless you are a fan of this French game show, of course. If you’re in New Bagan, eat at Black Rose. If you’re in Old Bagan, eat at Moon Vegetarian. The spread at Moon Vegetarian.. SO GOOD. You go to Bagan to see temples. That’s pretty much what you do. Unless your husband has a mild case of dengue, then you spend your afternoons watching foreign game shows and movies (or a Bug’s Life, if you’re lucky) on the few TV stations that come in. Amazing views of temples in Bagan. If you’ve seen a picture of Bagan, it’s probably been a hazy scene with temples for as far as the eye can see along with a bunch of hot air balloons. Unfortunately for us, you can only do hot air balloons part of the year due to weather conditions or something like that. Actually, I guess it didn’t really matter for us because hot air balloons are crazy expensive and we wouldn’t have done one anyway. 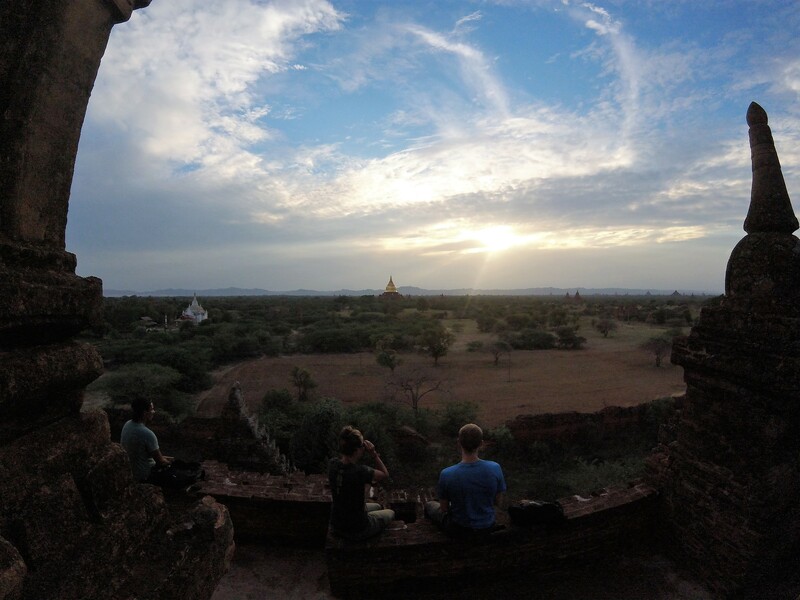 An affordable (backpacker budget) thing to do in Bagan is to watch a sunrise or sunset from a temple. This is unique activity in that you can actually climb up some of these super old temples. You used to be able to climb all of them. If the mood struck, and you wanted to climb up a random temple, more power to you! However, with the growth of tourism in Myanmar came a need to crack down and preserve these structures (and prevent some of the destruction that comes with unfettered access to temples). In February 2016 (so like, just a few months before we went), they passed a rule so only a few temples could be climbed. When I initially heard about this restriction (before we arrived) I was disappointed, but after seeing the conditions of the temples, I think it is a wise decision. A compromise, I guess, since it was such a huge draw to be able to climb up temples and enjoy the views. However, the whole time we were there, it was rainy and cloudy, so no sunrise or sunsets for us. It was still breathtaking, regardless of the sun status. As much as we saw of the sunset before the sun dipped into hazy clouds. Bagan has like 3,000 temples, it’s crazy. And cool. And beautiful. We just zoomed around on our little eBike and checked out as many as possible. Ebiking around to see temples. Another gorgeous temple in Bagan. Well, that’s what we did in the morning. Each afternoon, Sam almost died from dengue (hyperbole), and we had to hunker down in our hotel room. But in the morning, we saw temples! We climbed the ones we could and it was just.. deserted. We saw so many temples and very few people except for touts at the more popular temples, of course. Burmese people are definitely catching on to the whole selling items to tourists thing. One negative thing with visiting in the off-season is that the tout to tourist ratio becomes a bit imbalanced (see: lots of touts, not many tourists) resulting in the touts becoming much more persistent. It can be frustrating, but you really can’t blame them. Temples and a few touts. I ran 8 miles around Bagan. It was so much fun. The locals were so sweet to me.. they smiled and waved and cheered me on. Highly recommend a temple run! Temples. Have I mentioned the amazing temples in all directions for as far as the eye can see? Cows and temples, two peas in a pod! Dengue. Sam had a mild strain. It’s no joke, dude. Old Bagan market. We walked through it (very quickly), and it was all sorts of depressing. Touts just shouted, “will you buy this?” at us, combined with rotting meat and sickly looking dogs attacking each other. Yowza. Longyi. The longyi is the traditional skirt-type bottom that both genders wear in Myanmar though we saw more men wearing it. When we’ve mentioned before that we have heard Myanmar is where Thailand was maybe 20 years ago, we can give the longyi as an example. From what we heard, as more outside influence has come into Myanmar, it has become “cooler” to wear more Western fashion (see: pants). I would not be surprised if the longyi becomes a relic in Myanmar in another 20 years. A bunch of bros wearing longyis watching Chinlone. What is Chinlone, you ask?